4-year project • Ground broken Friday on first of three buildings, a 131.5M complex that will house exam, procedure and consult rooms. 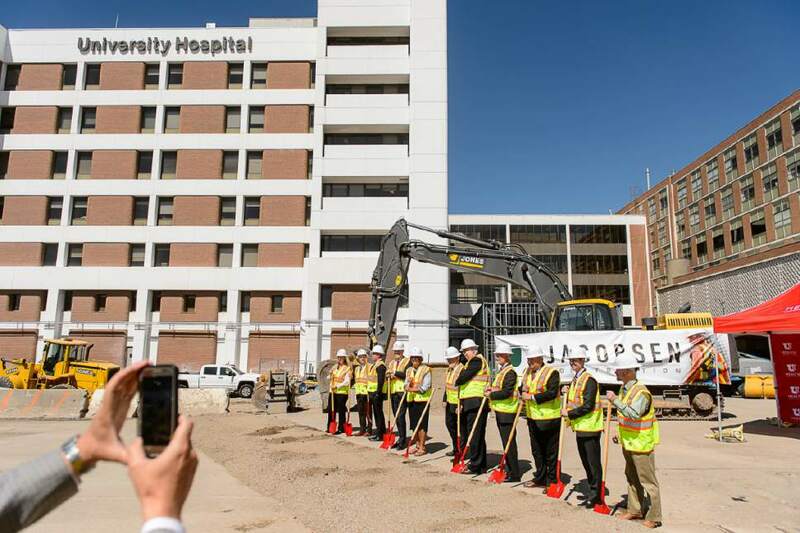 Trent Nelson | The Salt Lake Tribune Ground is ceremoniously broken for the University of Utah's new Ambulatory Care Center in Salt Lake City on Friday, June 30, 2017. The University of Utah broke ground Friday on a new, state-of-the-art complex for outpatient care  just the beginning of a $424 million project to replace the old School of Medicine Building. The 305,000 square-foot complex, estimated to cost $131.5 million, is one of three buildings that will go up over the next four years. The medical school building, which U. officials have said is 50 years old and in desperate need of an upgrade, also will be torn down during that time. The project "is really about collaboration ... and everyone on our campus has a stake in this project," said A. Lorris Betz, interim senior vice president for U. Health Sciences, on Friday during the ceremony. "Representatives from across our three missions, patient care, research, education, have come together to shape a new campus that will serve our future needs in the community." The ambulatory care complex will house 125 exam, procedure and consult rooms and is expected to support 100,000 new outpatient visits per year, according to the U. Currently, ambulatory care is housed in the medical school building and has 114 exam and procedure rooms. U. officials said Friday the new building won&apos;t serve a significantly higher number of patients, but that it will increase efficiency. Exam rooms, for example, can be used by any department at any time instead of being designated to a specific department as is currently the case, said Kathy Wilets, U. spokeswoman. Mary Beth Scholand, outpatient chief value officer in the U.&apos;s Department of Internal Medicine, said Friday that officials tried to design the building to improve patient experience. The focus was "to create a pleasant, inviting space for our patients, where they feel comfortable and where clinic flow is efficient and easy," Scholand said. "And I think we&apos;ve achieved this." Construction on a 170,000 square-foot rehabilitation hospital, also currently housed in the medical school building, will begin in about six months and is estimated to cost $95 million. Funding for this building will come from operating revenue bonds and private donations. The rehab hospital also will be completed in summer 2019. Once patients are moved from the medical school building to the two new buildings, the medical school will be demolished. This is expected to cost $12 million and take six months, officials said. At that point, construction will begin on the third and final building. The 350,000 square-foot Medical Education and Discovery building will go up where the current medical school is located. It will house the medical school, the Global Health Institute and "collaborative spaces for clinicians, researchers and students," according to the U.&apos;s website. Officials estimate the building will cost $185 million, paid for through $50 million from the state Legislature and $135 million of private donations. The expected completion date is the end of 2021 or the beginning of 2022. "After about 2021, there&apos;s not going to be any other place to build on this campus," Betz joked Friday. During the groundbreaking ceremony, Gordon Crabtree, CFO and interim CEO of U. Health, recognition of former Health Sciences Vice President Vivian Lee&apos;s contributions to the project was met with applause. Lee resigned in April after weeks of turmoil that began with her firing of Huntsman Cancer Institute CEO and director Mary Beckerle, who later was reinstated by the U. President David Pershing. Betz, Lee&apos;s predecessor, quickly was brought in to serve in her role until a permanent replacement is picked. "Without [Lee&apos;s] community involvement, legislative support and vision for these facilities, this whole transformation initiative would not have gained traction and we thank her for that," Crabtree said.